Daily Bible Study | Dr. Justin Imel, Sr.
Daily Bible study is an important spiritual discipline for the child of God. Those in Beroea “were more noble than those in Thessalonica, in that they received the word with all readiness of mind, examining the scriptures daily, whether [the things taught by Paul and Silas] were so” (Acts 17:11). Paul instructed his young protégé, “Give diligence to present thyself approved unto God, a workman that needeth not to be ashamed, handling aright the word of truth” (1 Timothy 2:15). If we are to present ourselves approved in God’s sight and properly handle “the word of truth,” we must give ourselves to diligent study of the Word. Scripture deserves to have a place of primacy in our lives, for that Word, inspired by the Holy Spirit (2 Peter 1:20-21), will judge us (John 12:48). By studying that Word, you may grow “unto salvation” (1 Peter 2:2). 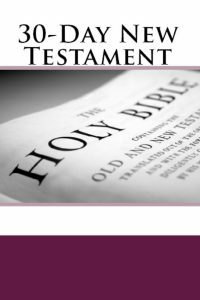 This copy of the New Testament is designed to help you grow “unto salvation,” be prepared for that Great Judgment Day, be approved unto God, and examine the Scriptures for truth. This New Testament divides daily Bible readings into easily readable segments to allow the Word to penetrate and change your life. Can we not all find time to spend time in the Word that will save our souls?